This is a graphic organizer that is used to find and analyze characters in texts for indirect characterization. 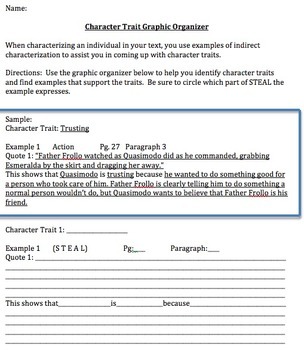 This serves as a guide to show students how to find quotes that indicate character traits through the STEAL method and analyze the quote for an inferred character trait. This is an ideal worksheet for assisting students in building literary analysis essay.